“Stay in the story.” That’s the advice retiring missionaries Nik and Ruth Ripken offer the next generation. The Ripkens, known for their extensive research into Christian persecution, have said they’re retiring in March 2020 after 35 years of service with the Southern Baptist International Mission Board. Originally from Kentucky, the Ripkens were appointed by the then-Foreign Mission Board in August 1983. Through the course of their career, they lived in seven countries: Malawi, South Africa, Kenya, Somalia, Germany, Ethiopia and Jordan. With a recent trip to Cuba, the list of countries they’ve visited reached 86. “We’ve also sat with believers in persecution for days and days at a time in 72 of those countries,” Nik said. Those in-depth conversations shaped the Ripkens’ lives and legacies. 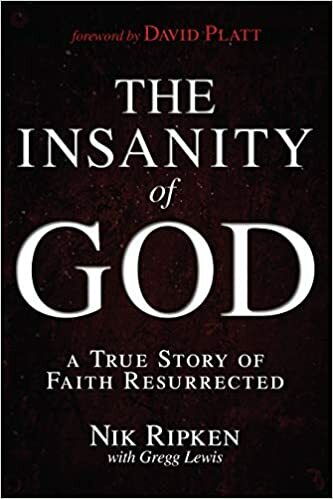 Their research, which spanned 15 years, resulted in hundreds of interviews and culminated in two books, The Insanity of God and The Insanity of Obedience, and the feature film, The Insanity of God. More than 90,000 people in 800 theaters viewed The Insanity of God when it was released in August and September 2016. Ruth felt Timothy’s death was the most challenging experience of her missionary career, and the challenge of moving past the grief was equally great. “Beyond [Timothy’s death] was figuring out how I continue to serve and live and be who I need to be post that,” Ruth said. Nik and Ruth’s story began in rural Kentucky. As a 9-year-old girl, Ruth attended Camp Cedarmore in Bagdad, Ky. There she met Bertha Smith, a Southern Baptist missionary who served in China and Taiwan from 1917 until her mandatory retirement at age 70 in 1958. “I felt so overwhelmed by the Holy Spirit that that’s what I wanted to do,” Ruth said. She talked with a few people about what to do next, and they told her to write the Foreign Mission Board. “I did, and they sent back information,” Ruth recounted. The mission board encouraged her to write every year and tell them where she was in the process. When the Ripkens went for their appointment interview with the FMB in 1983, the consultant showed the Ripkens their files. Ruth’s file contained every letter she had written the FMB since she was 9 years old. Then, after Timothy’s death in 1997, Nik and Ruth lived on the campus of Georgetown College in Georgetown, Ky., from 1997 to 2000, hosting 60 to 90 students in their home for six hours every week. Of those, 60 have served as short- or long-term missionaries, Nik said. Understanding the long view of God’s plan helps believers stay in the story. In many cases, this may mean enduring difficult situations much longer than we think possible or necessary, Nik said. “Who are you?” a guard demanded. “I am a son of the living God, and Jesus is His name!” Dmitri replied. “He is hurting every day from the abuse he endured, but he wakes up every day singing with joy. He is living a life of joy because his story is all over the world,” Dmitri’s son said.